CMCP787A Premium Side Exit Accelerometer Reliability Direct, Inc. Your Direct Source for Reliability, Maintenance, Test & Measurement! The CMCP787A Premium Side Exit Accelerometer is the ideal accelerometer for most types of rotating equipment. 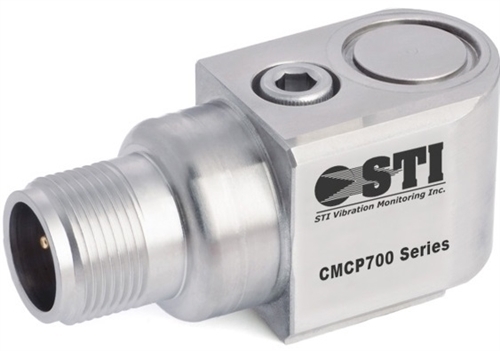 The CMCP787A is lightweight and can be use for route based or permanent mount applications. The sensor is designed so that cross wiring will not harm the internal components and provides protection against ground loops. The CMCP787A is waterproof and can be hosed down or submersed when using the proper extension cable such as the CMCP602 series. Additional sensitivities such as 10mV/g, 30mV/g, 50mV/g, 250mV/g and 500mV/g are also available in the same sensor package and can be ordered by adding the sensitivity after the base part number. Call to order non-standard sensitivities.